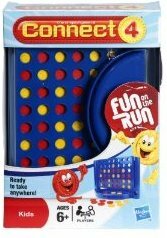 This travel size Connect 4 game is from the Hasbro range of games, this is a scaled down version of the original game. The aim of the game is simple, get 4 of your coloured discs in a row either horizontally, vertically or diagonally to win. Take it in turns to slot your coloured discs in to the stand to try and get 4 in a row or to block the other player from winning. Only two people can play, male or female. It is recommended for people over the age of 6. Connect 4 is a simple but enjoyable game. The travel size makes it perfect to take on any long journey and be taken out your bag to play and pass some time. Only two people can play this at a time, but that doesn't matter too much with it's purpose being for travelling it would suite two people sat in the back of a car or sat together on a train,bus or plane. I use to love playing this with my Dad and could play all afternoon trying to beat him so will definitely be giving this as a Christmas present to my 7 year old cousin - mainly to keep him quiet in the evening! The simplicity of this game is what seems to make it more enjoyable and unlike Monopoly and Cluedo you don't need to dedicate your whole weekend to playing this, but can still be kept occupied for a decent amount of time whilst you challenge a friend or family member to a game. - Comes in a handy container to keep all the pieces in. - Portable version folds away easily and would fit nicely into your bag. - You're never too old to play. - Easy to set up. - Only two people can play the game at a time. - Could come with a bag to put it in. How Much Is It? - Travel Connect 4 available from www.toyday.co.uk and cost £6.99, considering the play value you get for that price, it is an absolute bargain. Toyday also stock other enjoyable travel size games such as Hungry Hippos and Guess Who.